After drinking our frozen irish coffees all too quickly (it's practically impossible to stop sipping on its cold, creamy deliciousness) we decided a slightly buzzed bike ride through the French Quarter was in order. Since we store our bikes in the back of the truck, we always have them. Which is great in instances like these. The French Quarter is ideal for biking; no hills, very little traffic (an occasional car or horse-drawn carriage) and streets lined with incredibly beautiful buildings. We slowly cycled down Royal Street towards Jackson Square, pausing every block to pull over and snap a photo or stare enviously at an ornate iron balcony dripping with plants and flowers. 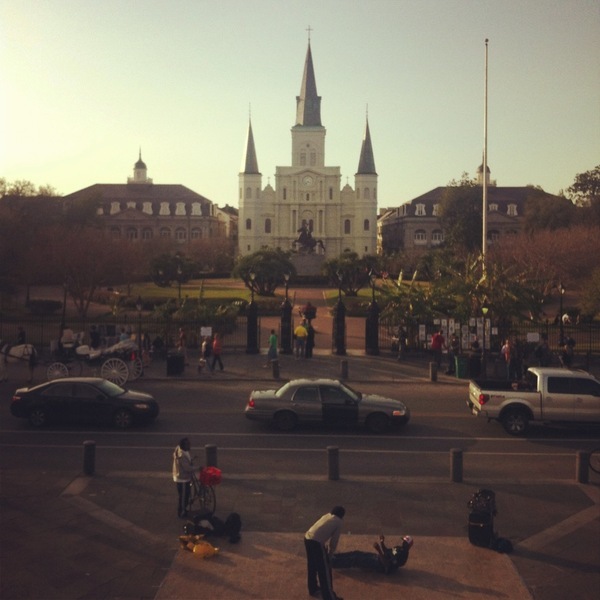 We looped around the square and peeked at the Great Mississippi River, passing street performers, wide-eyed tourists, and artists selling signs exclaiming "Laissez le bon temps rouler!". We were having no problem letting the good times (and bicycle wheels) roll. 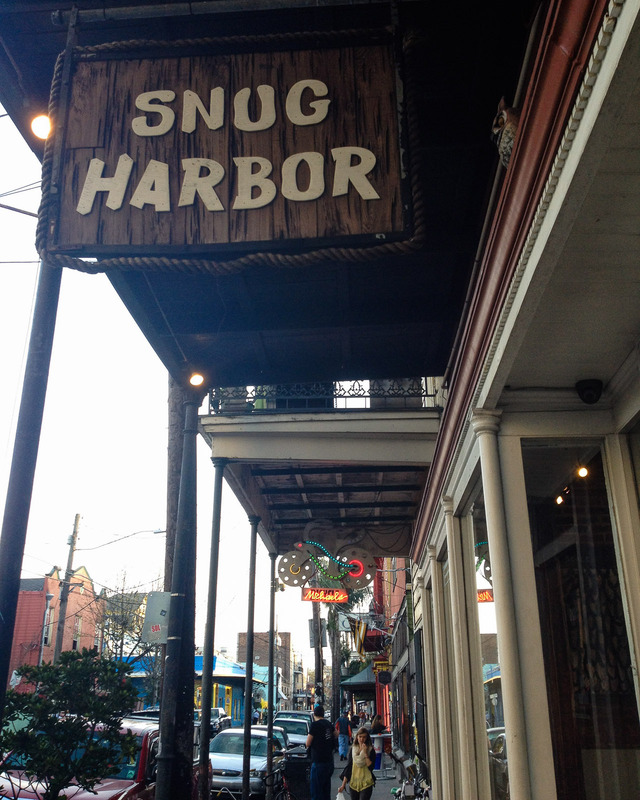 Back on Frenchman Street where we began our quick bike tour, we locked our bikes up and walked over to Snug Harbor, a jazz bar and restaurant that was suggested on our map. We got there right as they opened at 5pm and posted ourselves at the bar. Even though it was broad daylight outside, it felt like 10 o' clock at night inside Snug Harbor. Every surface was dark and the ceiling was unusually low. The lights were dimmed to the point of nearly off with spotlights on photographs by a local photographer. We ordered a couple of local Abita brews and spoke in whispers, as we were the only ones there. 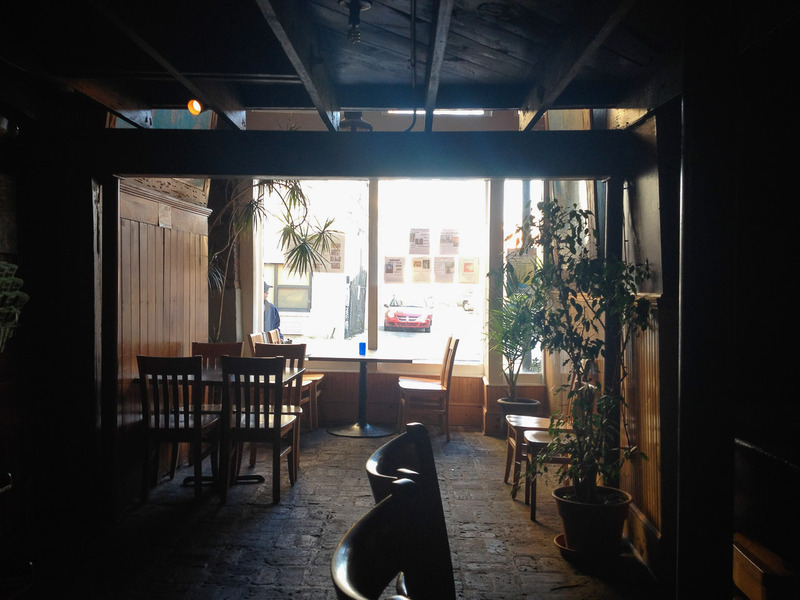 Snug Harbor certainly fits the description of a jazz bar; the sultry, shadowy atmosphere begs for a smooth saxophone solo. Our bartender mentioned they have two shows a night, 8pm and 10pm, which typically sell out. While we were sipping our beers, a couple came in and ordered two Monsoons. After watching the bartender pour fat doses of three different kinds of rum and a house juice mix into a mega souvenir cup, I knew I had made the wrong beverage choice. Not only do I have a weakness for souvenir cups, but fruity rum punch-type cocktails are my guilty pleasure. And at the low, low price of eleven dollars for what equates to three sugary cocktails that you can walk the streets of New Orleans with, how can you go wrong? I'll be back for you, giant Monsoon cocktail. I'll be back. Special thanks to Emily P. (who suggested Great dive bar in NOLA) for making this blog post possible!